In reaching out beyond the frame of conventional filmmaking and film presentation, many artists engaged with ‘expanded cinema’. The term came to encompass works that made use of multiple screens, live performance and film installations, emphasising the primacy of the projection event and questioning the role of the spectator. It was a field richly explored by those associated with the London Film-Makers’ Co-operative, and amongst its key practitioners were Malcolm Le Grice, Gill Eatherley, William Raban and Annabel Nicolson. The radical formalism of the rough, artisanal qualities of work made in the LFMC workshop was further enriched in unique ‘film actions’ that employed performance and improvisation. Expanded cinema took these filmmakers beyond the auditorium and into art spaces. 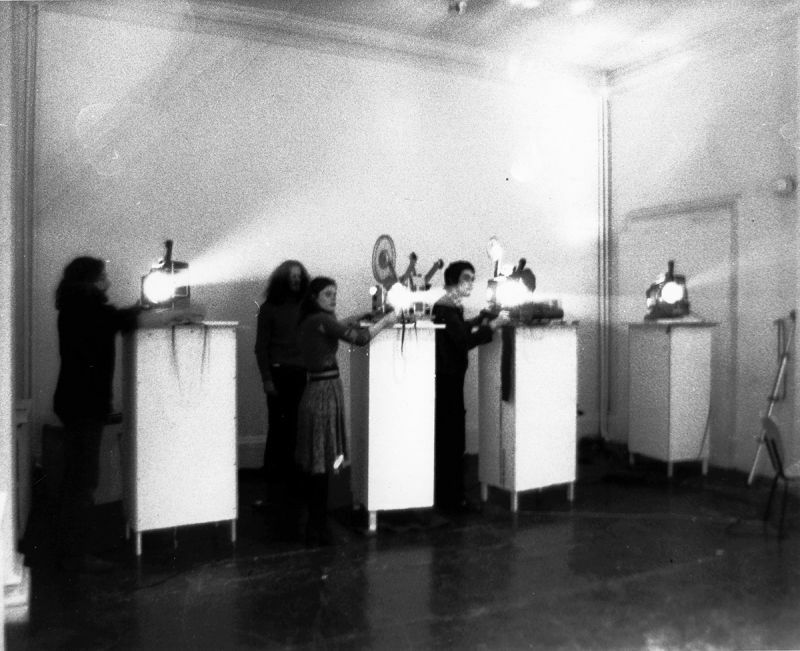 A weekend of projections at Gallery House in March 1973 was the first of a sequence of events at venues including the Scottish Arts Council Gallery, Walker Art Gallery, The Place and the ICA. The flexibility of open exhibition spaces prompted the development of installations in which film loops could be orchestrated over extended time periods, and projected works that eschewed cinematic conventions. For this special event at Raven Row, Malcolm Le Grice, Gill Eatherley and William Raban will reconvene as the Filmaktion group to animate the gallery using an array of 8mm, 16mm and slide projectors. A shifting programme of installations by Eatherley and Le Grice will run throughout the weekend. These pieces for itinerant viewers will be interrupted twice daily for the presentation of mixed programmes of multi-screen films and live performances. Malcolm Le Grice’s shadow play Horror Film 2 will be staged in public for the first time since 1973. Referencing the pre-history of cinema, actors and objects cast shadows that are viewed in 3D by an audience wearing red/green anamorphic spectacles. His performance Pre-Production will also be revived alongside a three-screen version of Whitchurch Down (Duration). Gill Eatherley will present the film environments Sicherheits and Chair Installation and perform Aperture Sweep, whilst William Raban’s dynamic multi-screen projections include Diagonal and Surface Tension. His Filmaktion Timelapse (documentation of a week of events at the Walker Art Gallery in 1973) will be shown continuously in the entrance hall. Annabel Nicolson’s work will be represented by two rarely-seen 16mm films, Shapes and Frames. The latter was created from fragments of a Gallery House performance in which the artist dissected her earlier film Flavia by manipulating it manually with a slide projector and a hand-held condenser lens. Filmaktion is curated for Raven Row by Mark Webber. With thanks to LUX. Having been asked to show his films at Gallery House, Malcolm Le Grice in turn invited David Crosswaite, Gill Eatherley, Annabel Nicolson and William Raban – all colleagues at the London Film-Makers’ Co-operative (LFMC) – to join him in staging a weekend of “film action and installation”. 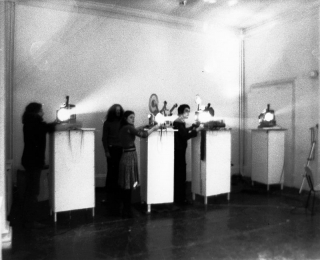 The subsequent event, which took place from 16-18 March 1973, was an important moment in the development of ‘expanded cinema’, featuring a variety of works that incorporated improvisation, multiple screens, live performance and looped projections. The radical formalism and rough, artisanal qualities of the films made in the LFMC workshop were here further enriched by unique ‘film actions’ that emphasised the primacy of the projection event and questioned the role of the spectator. In the same year, this informal collective (often including other filmmakers) would also show their work at the Scottish Arts Council Gallery (Edinburgh), Walker Art Gallery (Liverpool), The Place and the ICA (London). The flexibility of open exhibition spaces prompted the development of installations in which film loops were orchestrated over extended time periods, and projected works that eschewed cinematic conventions. Though the word ‘Filmaktion’ was only used in this period as the title of the Walker Art Gallery show, writers and curators have since adopted it as a collective name for the core group of Eatherley, Le Grice, Nicolson and Raban.